It's finally getting cold around here which I know some people are pretty bummed about but not me, I am ready for the days of it being cold and dreary (seriously). These are the days that I like to hunker down and keep myself all warm and cozy. And what is more cozy then a big bowl of hot soup? Nothing I say. Or maybe a big cup of hot tea and a cozy blanket by the fire, but I don't have a fire so soup it is. And I know a few of you people have a little pie pumpkin or two laying around from Halloween and are thinking " what the heck am I going to do with it". Well I got you here. You are going to make that pumpkin into something great and amazing that is not a dessert (because you are still working your way through all the Halloween candy). You will make it into soup and then you will eat it and then you will thank me later. The stuff. A little old sugar pumpkin, some red lentils, celery, a carrot, and an onion. A few heads of garlic, turmeric, coriander, cumin, and ginger, salt and pepper, and water to round it out. Start with dicing up the carrot, celery, onion and garlic. Into a heavy bottom pot they go. Stick the pot on heat to sweat the veggies a bit. Dicing up the pumpkin. No fuss here, just chop it in half and scoop out the seeds (keep seeds to roast and top soup with) then cut into little chunks. 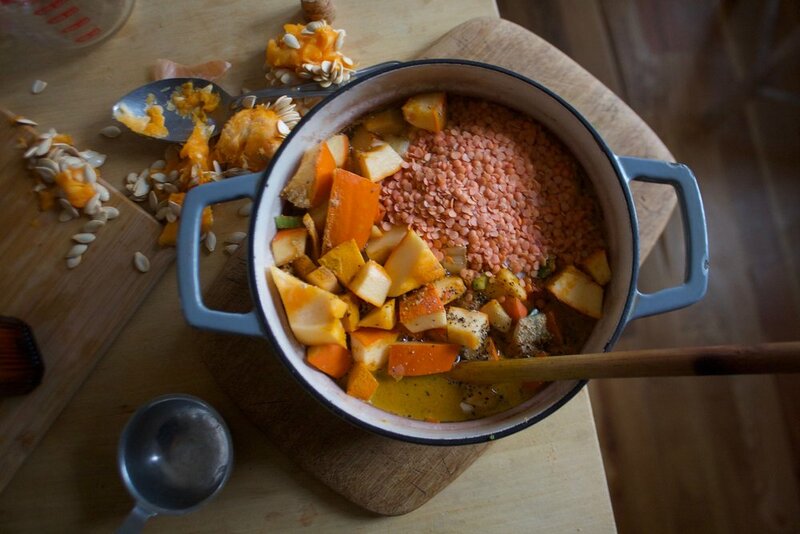 Grab the pot that the veggies are cooking in and toss in the pumpkin, the spices, the lentils, and the water. Give it a good stir and back to the stove. All cooked, smelling and looking so good. Now blend it all up. A smooth creamy delicious bowl of pumpkin warmth and goodness. 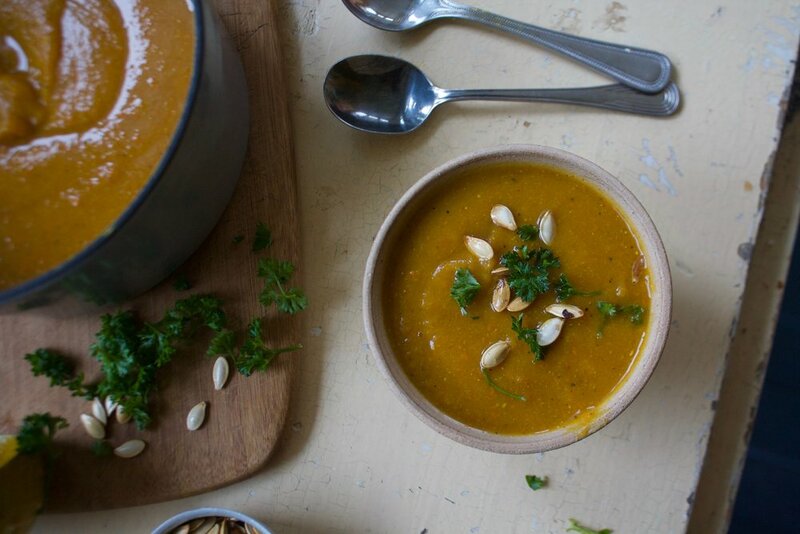 A soup to take into the chilly days ahead. Start by dicing up the carrot, celery, onion and garlic. Toss into a large heavy bottom pot with a splash of olive oil. Place on medium heat to start cooking. Now grab pumpkin, cut in half, and remove all the seeds (reserve seeds for roasting) Dice up the pumpkin and toss into the pot with the veggies. Add in the spices, the lentils,3 cups of the water or stock, and a pinch of salt and pepper. Bring pot to a boil then reduce heat to low. Place lid on pot, but not tightly, and let the soup cook for about a 1/2 hour or until the pumpkin is fork tender. Once everything in the pot is all cooked up it needs to be blended. You can either transfer to a blender or use a emersion blender and blend until the soup is a silky smooth Either way, be freaking careful cause the soup is hot! While you are blending, if you think you need to add more liquid, go for it. You can make this as thick or thin as you like. And now soup time! Laddle into bowls, top with parsley and roasted pumpkin seeds (optional) and get to eating all the good.